Join thousands worldwide who are seeing dramatic results in their organizations and communities thanks to the powerful health benefits of Tai Chi Easy™. Breathing Practices – triggers the de-stressing effects of the Relaxation Response, increases circulation and energy, and enhances the body’s natural healing process. Best of all, anyone can learn these methods, no matter their fitness level and quickly begin leading practice sessions to disseminate the benefits throughout an organization. 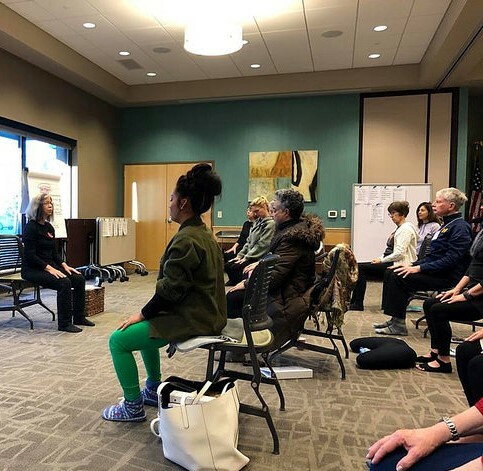 After completing the 25-hour program, graduates of Tai Chi Easy™ (Practice Leaders) are fully empowered to help spread the knowledge throughout their organization. In return for the training, new Practice Leaders commit to reach out within their organization and share their practice. Practice Leaders are free to use the skills and knowledge they receive to benefit their communities at large, too. Your organization can choose to sponsor a low or no-cost community practice group, which may help foster a positive community image. It’s an amazing win/win opportunity to add to your wellness program! How is Tai Chi Easy™ Training Conducted? Locations: Practice Leader Trainings come to you. We'll provide assistance with venue selection and guidance on training space requirements. Class Size: Trainings usually consist of groups of 20-30 students but can be modified based on organizational needs and the availability of facilities in which the training will be conducted. Refresher Training: A refresher is held after each workshop (usually virtually), open to each new Practice Leader. In addition to skill refinement, information is shared on how to promote, advertise, and further expand Tai Chi Easy™ practice in your organization. Fees: No ongoing or renewal fees. Your Tai Chi Easy™ training fee will include all Practice Leader learning materials and certification costs. How would members of your organization benefit from exposure to this powerful yet simple self-healing practice? Find out more by contacting us and we will discuss how to bring this transformative, cost-effective training to your area. Also, please see our Organizational Training Event Flyer. We look forward to hearing from you! What is Qigong and Tai Chi? Philosophically, Tai Chi is a form of Qigong (chee-gung), involving movement which works to improve the practitioners’ immune system. This movement promotes the relaxation response that effects every system in the body to encourage its restoration of function. This increases a person’s self‐healing and self-recovery capabilities and enhances one’s regeneration potential.